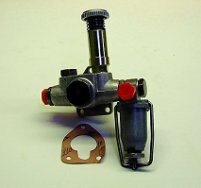 We stock a large range of Lift Pumps and Lift Pump Spares. CAV Types: BFP, DFP, PPS and PLD. Bosch Types: Standard FP/K22 and MW. AMAL Types: Gardner L3, LW, LWK, LX, LXB and LXC. Nippon Denso and Diesel Kiki. We also offer a complete reconditioning service on the CAV, Bosch, Japanese and AMAL Types. The kits comprise all necessary O-Rings, Gaskets, Copper Washers, Valves & Springs and Hand Primer. Pre-Filters, Glass Bowls, Washers & Filter Gauzes etc.